ith Vox Machina’s final battles of the campaign fast approaching, we decided it was time update our compendiums for the big bads of this arc: Vecna and Delilah Briarwood. You can follow these links to check out the full compendiums for ALL the information, but below the break, we have a quick summary of what we’ve added since our last update following episode 106. First up: Vecna. Warning: spoilers abound! If you haven’t watched through episode 112, you have been warned. Since his ascension to godhood two days ago, Vecna has resurrected a dead titan and is currently using it to transport Thar Amphala towards Vasselheim. He’s also managed to reconstruct the Tower of Entropis that Keyleth and Pike destroyed when Thar Amphala was still full planted in the Shadowfell. In his free time, he has been terrorizing the populace of Exandria with nightmares and ominous, unnatural clouds that show images of silently screaming faces, and spying on anyone he wants, whenever he wants. 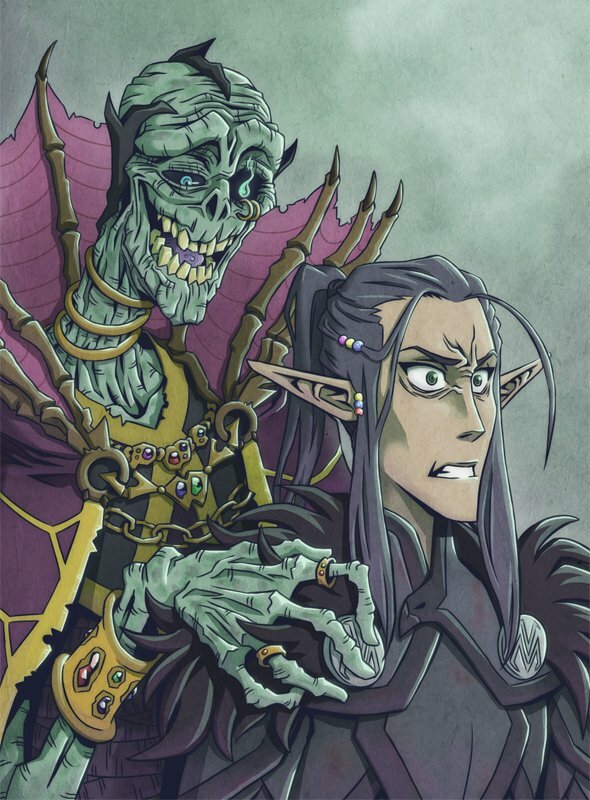 Vecna has made a particular show of force by threatening the relatively unprotected loved ones of the leaders of Vasselheim and Vox Machina with his knowledge. Fortunately, powerful protective magics that block divination, such as the Band of Shrouds Highbearer Vord gifted to Vex, appear to stop both Vecna’s taunting nightmares and ever-present spying eye. Vecna’s “all-seeing” does not appear to stretch to planes beyond the Prime Material, either. Vox Machina has been untroubled by dreams as they slept in Scanlan’s mansion, and Vecna couldn’t find Vox Machina in Thar Amphala until Vax and Keyleth were separated from Vex and the Band. Vax’s retreat may have revealed the location of the mansion, but did not allow the Undying King passage inside. In the meantime, Vecna remains in Entropis in the center of Thar Amphala. The city itself rests at the top of the undead titan, and is protected by a barrier that appears to repel physical and magical attack, as well as attack any wyvern, dragon, or airship that gets too close. The city (and the titan) is infested with undead, and the skies are patrolled by gloomstalkers and one giant skeletal dragon. Vecna’s servants patrol outside and around the city, with his most powerful allies ready at his beck and call (e.g., the Death Knight that Keyleth scryed as he stepped to the top of the tower with Vecna himself). Thanks to @fionawdunn for this art piece! The Death Knight isn’t the only ultra-powerful lieutenant Vecna has at his direct command. Delilah, once again, just won’t stay dead. However, since her most recent return, we don’t know much about what exactly Vecna has her doing outside of assisting in the resurrection of the titan. It’s fairly safe to assume Vecna sent her after Vax and Keyleth after he spotted them away from Vex’s Band of Shrouds, and that she’s been up to something sinister. Near the end of episode 112, she found and dispelled Scanlan’s Magnificent Mansion, then attempted (and failed) to counter Keyleth’s Plane Shift to block Vox Machina’s escape. Even more shocking was the revelationg that Sylas seems to have picked up Delilah’s habit of refusing to die. Since he’s only just now returned, we hypothesize that Delilah was not directly behind his resurrection, and point our fingers at lich god shenanigans. We have yet to learn anything about the form he’s managed to return to thanks to only the briefest of glances. However, even if he hasn’t been enhanced since his death, Sylas Briarwood remains a very dangerous threat.